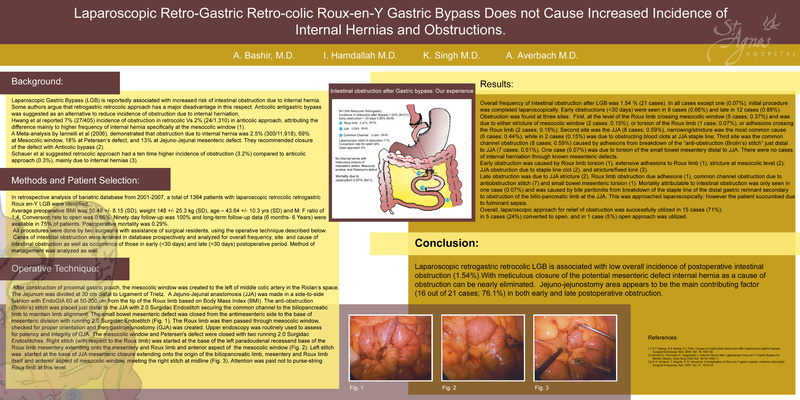 Laparoscopic Retro-Gastric Retro-colic Roux-en-Y Gastric Bypass Does not Cause Increased Incidence of Internal Hernias and Obstructions. Background: Laparoscopic Gastric Bypass (LGB) is reportedly associated with increased risk of intestinal obstruction due to internal hernia. Some authors argue that retrogastric retrocolic approach has a major disadvantage in this respect. Study Design: From 2001-2007, a total of 1364 patients underwent LGB, with conversion rate of 0.66%. Ninety day follow-up was 100% and long-term follow-up data (6 months- 6 Years) was available in 75% of patients. All potential sites of internal hernia i.e. between mesenteries of jejunum and jejunum, Roux limb and Mesocolon and Peterson’s space were closed with running non absorbable sutures.